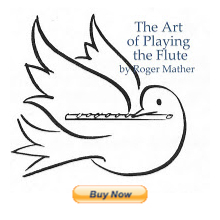 Here is a link to free flute sheetmusic. Great for weddings, garden parties, and flute lesson sightreading. I'm sure that flute students would also love to play these transcribed sonatas for flute duet. Also, here's the link to all the free flute duets in pdf at Petrucci music library. And here are all the links to the free pdf music for DUETS for flute grade 3-5. Hi Jen. Thank you, your website has made flute playing a lot of fun for me, a 60 year old beginner.. Thanks Charlie. I shall put it on my summer reading list. Love books like that. In fact, it was after reading such a book that I wrote the following poem; very similar. hahahaa! But no longer, as alas, his flute has gone mute. Though his name was quite famous, he says, in his time. With anecdotes drawn from his orchestra days. Where the meanest of critics gave him five curtain calls. Was the day he emerged from Opera Pitt Hell. And I used to know seven Concerti by heart. And I know how to balance the flute on a wart. With an hour of rehearsal, I never could fail! Whether I played melody or the meatier parts. When the curtain was stuck, I once stood on my head. And I once did flute yoga in the back on a mat. He will tell how he high-C'd the head of a pin. When the director had fired the tenor in rage . When a score called for war-cries and 'jungles of rain'. To rescue a child when the pit was on fire. As we did in the days when Victoria reigned! `Well, the Opera today---it just makes one SICK! On the day I emerged from Opera Pitt Hell.